At exactly 10 a.m. tomorrow, about 5 million people in Southern California will drop to the ground, take cover under a sturdy piece of furniture and hold on at the same time. Radio stations and school p.a. systems will play a sound track of rumbling and crashing, along with a man's voice declaring, "If this were the magnitude 7.8 earthquake we're practicing for today, you would be experiencing sudden and intense back-and-forth motions of up to 6 ft. per second. The floor or the ground would jerk sideways out from under you. Look around and imagine." If this sounds weird, it's because it is. The Great ShakeOut, as it's being dubbed, is the biggest public emergency drill in U.S. history  and as such, it is a radical idea. Normally, large-scale disaster drills, which happen weekly across the country, are designed for professional rescuers, emergency managers and politicians. Not for you, and not for me. In fact, the people who matter most in a real-world emergency  the neighbors, office workers and students who do the majority of the lifesaving during big disasters  are almost never invited. California's drill, too, originally was scheduled as an exercise for only emergency officials. That exercise, called Golden Guardian, will involve about 5,000 officials, from the local police to the U.S. military, all pretending they are responding to a major quake along the San Andreas Fault. But in this case, California decided to invite the people too. Schools, offices and random Joes have been registering for the drill over a span of months. 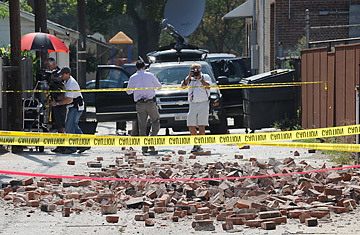 (In the two days after the 5.4-magnitude Chino Hills quake in July in California, 57,000 people registered.) Every city employee in Pasadena supposedly is participating, which should make for an interesting scene at City Hall come 10 a.m. You can already play a game to see if you know how to survive an earthquake. (I scored only 9 out of 14 on the first try, but now I am totally rocking an 11.) You can download audio to accompany the drill. You can watch a YouTube video about what would happen to California in such a quake. And, starting at 10:02 a.m. on Thursday, you can play a sprawling, multiplayer collaboration game called After Shock to see what happens on the other side. Behind all this flash and exuberance is a stark reality. The southern section of the San Andreas Fault hasn't moved in about 300 years. We know it moves about every 150 years. So California is overdue for a major quake. In April, a new report concluded there is a 99.7% chance that a magnitude 6.7 or stronger quake will shake California within the next 30 years. But most Southern Californians cannot readily imagine a quake of that scale. They haven't experienced one before, so they don't know how the g-forces will feel. The intent of the ShakeOut drill is to hijack the imagination. "Time and again, we've heard that there is a weak link between the scientific understanding of quakes and the ability of the public to pay attention and change their behavior," says Mariana Amatullo at the Art Center College of Design, one of the organizers of the event. "The goal was to find new opportunities for the public to be a little more resilient and empowered." In earthquakes, most people do exactly the wrong thing. "Unfortunately, adults fail miserably when it comes to quake-safe actions," says Inés Pearce, a spokeswoman for the Earthquake Country Alliance, the umbrella group for all the organizers. They run outside or inside. Or they run to a doorway, which is no longer considered wise. Most injuries occur when people try to move during the shaking. It is much safer to drop, cover and hold on close to wherever you happen to be standing. Children actually are much better at this  because they have regular drills in school. So populist drills like this can save a lot of lives. As things stand now, if Thursday's "quake" actually happened, about 1,800 people would die and 53,000 would be hurt. Damages would reach an estimated $213 billion. Most people would be without electricity, clean water, ATMs, YouTube videos and multiplayer collaboration games for weeks or months. See pictures of the fires that devastated Southern California.